Friends ask all the time how our children fare while traveling? Do they throw fits and get antsy? How do they handle flights? For the most part, our children are great travelers. We exposed our kids to planes, trains, and automobiles at a young age. We drove 14 hours to the Florida panhandle when our boys were just 2.5 and 6 months old. Our first domestic and international flights were when they were 5, 3, and almost 2. 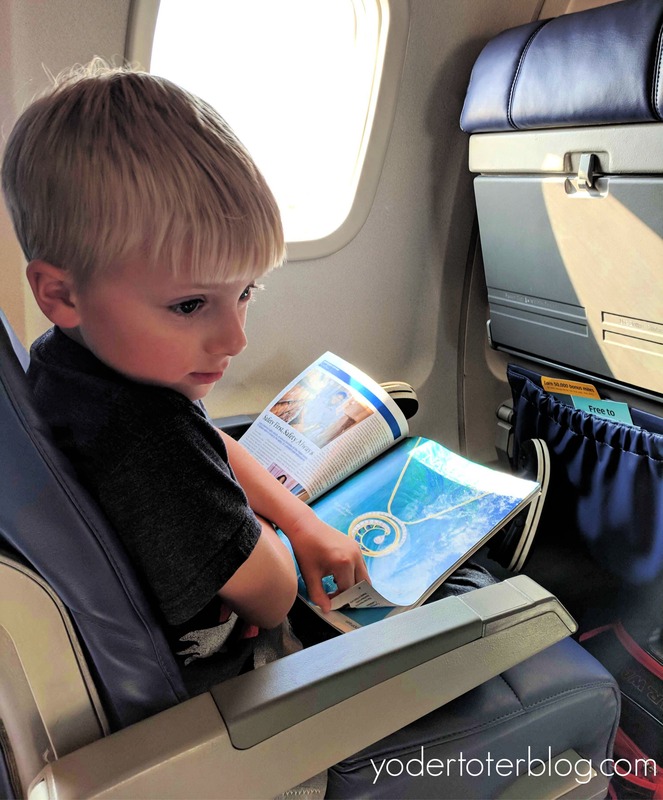 Other than making an intentional effort to travel while our kids are young, our one piece of advice is this: put away the screens. Limiting screen-time at home allows for better travel days. Don’t worry, you don’t need to brandish your car with the latest “Kill your TV” bumper sticker. We all spend too much mindless time looking at glowing rectangles. However, if screens are allowed to be overused for every jog across town, you may never make it through an international flight. I began thinking more about this issue while reading The Tech-Wise Family by Andy Crouch. Crouch says, “But (very) nearby are technological forms of distraction, from video games to constantly updated social media. They do little to develop our abilities to wait, pay attention, contemplate and explore – all needed to discover the abundance of the ordinary.” For example, if you give your children a phone or iPad every time you have to wait at the doctor’s office or BMV, how will you expect them to wait hours for a delayed flight or cross-country drive? If screens hold the golden ticket to all joy, can kids find ways to entertain themselves? How will they be fixated by a mountain sunset or a breaching whale when Candy Crush beckons? We need to be intentional at home – teaching children to entertain each other and themselves. 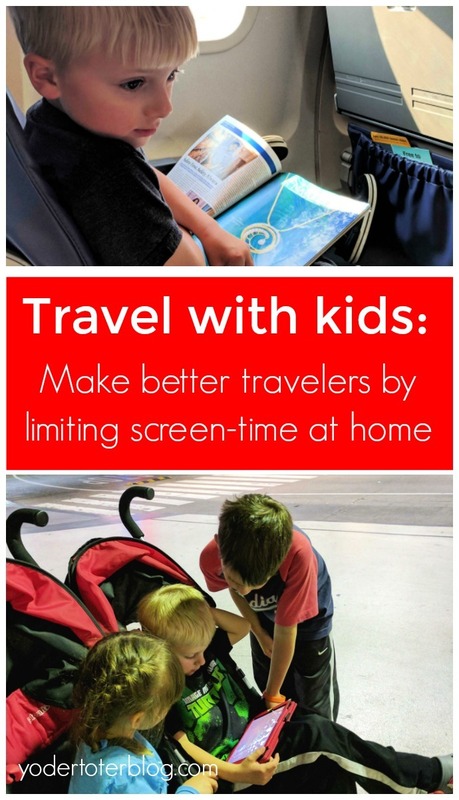 Can you set up parameters with kids and screen-time that will allow for healthy travelers? I’m no expert on this, but here are a few tips from our household. When at home, kiddos are not allowed to play video games during the week. If schoolwork is finished, the children may play video games Friday nights and throughout the weekend. This is timed. We have a DVD player in our van, but try not to default to it. When we know we have an extra long drive, we will play a few DVDs, but for jaunts to grandmas (1 hour) or across town, the DVD screen does NOT come down. We travel with a Kindle Fire 8 . A Kindle does not connect to mobile data, so before leaving home we have to download any programming we plan to allow. I’ve found this to be a great feature because the children can’t stream an unlimited amount of shows and movies! Now that our kids are bigger, we are thinking of getting the kids version of the Fire so that they aren’t always taking away my reading material! While we do limit screen-time at home, we are much more generous with it during travel. Some days we all use screen time too much (I see you Instagram stories)! After long travel days in Ireland, crammed in the back seat of an economy car, our kids couldn’t wait to get back to our Airbnb where Power Rangers was being aired every evening. I wasn’t hard on them because they’d been looking at scenery and castles all day long. Do you limit screen-time at home? Are you intentional about putting screens away during travel? Here’s a free printable with some screen-free play ideas!